exam, seven-ninths of them passed. (in terms of π ). by using π ≈ 3.14. 104)Write as a decimal . 108) Which is the better buy? side of the following right triangle. solve : 24 is what percent of 120? 234.5 is 35% of what number? 117) Maryland has a sales tax of 6%. Delaware has no sales tax at all. (ie; leave answer in terms of π ). measured three inches on each side. What was the volume of the cube? 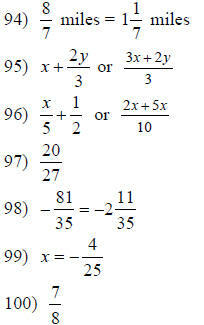 End of non- calculator portion . 102) a) 8π in. b) 25.12 in. 121) A = 12.685 square cm.